And bigger than we had hoped! Thanks to Steve Meador with the help of Melanie Thomas, Ralph and Babette Smith, Gary Meador, Bill Adler along with others as a planning committee organized an awesome reunion for August 6-9, 2010. We will be posting more results along with pictures of the event soon. Friday August 6th, 2010 evening – A memorable dinner/dance at the beautiful NM Farm and Ranch Heritage Museum, with an excellent buffet dinner amidst breathtaking views of the Organ Mountains, music provided by Master DJ and WSMR Brat Larry Fieldler and photography provided by Jack Diven Photography. Saturday Aug. 7th – Tour of WSMR, included the historic launch complex 33, a scrumptious luncheon at the Frontier Club (formerly the O-Club) with Guest speakers, Carlos Bustamantes, a long time engineer on the base and an inductee in the WSMR Hall of Fame, and Mr. Robert S. Carter (Executive Director of research, testing and evaluation). We then visited the WSMR Museum. Later that evening we enjoyed a fun filled evening reception and delicious Mexican buffet dinner at the Sunland Park Racetrack & Casino. A BIG THANK YOU GOES OUT TO THE 2010 REUNION PLANNING COMMITTEE! 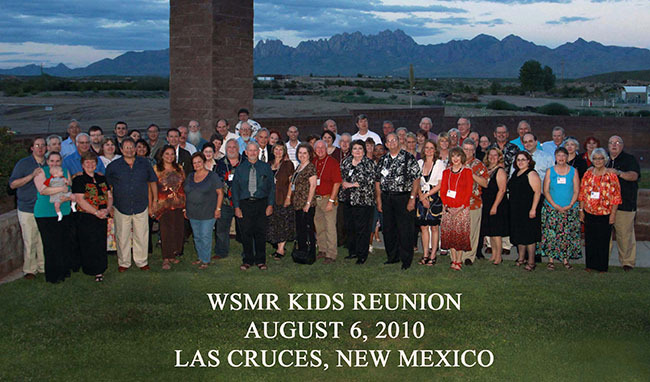 I am sure all those that attended and had a great time reuniting with our friends, classmates and neighbors thank you for working so hard to make this 2010 WSMR Kids Reunion happen. Thanks again. As for this committee and future committee members, you have no idea how much your efforts are appreciated. IF YOU ATTENDED THE REUNION, PLEASE, PLEASE, PLEASE SEND US SOME OR ALL THE PICTURES THAT YOU TOOK!! IT WILL BE SUPER TO BE ADDED TO THE MEMORY ALBUM AS WELL AS ADDITIONAL PHOTO ALBUMS THAT WILL BE POSTED OF THE EVENT. Well, we did it again. We held our fifth “WSMR Kids’ Reunion”! WE HAVE AN IMPORTANT REQUEST FROM THE WHITE SANDS MISSILE RANGE MUSEUM! I am in the process of collecting artifacts, photographs, blueprints, stories to create an exhibit, here at the White Sands Missile Range Museum, to tell the story of the children and youth programs/activities of WSMR for the past 65 years. I understand that you will be having your Reunion in August and I would like to invite you to bring with you anything that you might want to share or to be considered for use in this exhibit. I specifically am looking for old photos of the buildings that once housed the various youth activities and photos or programs, invitations for any special events. Robert Ice, a graduate history student at NMSU, joined us Friday night, Aug 6, at the NM Farm & Ranch. He videotapedoral histories of those attendees who cared to share their memories of growing up on post. I’m told that NMSU will provide us with copies of the interviews which we could put on the website. We will see.